If you’re the kind of person whose heart and home have always been shared with animals, then chances are you’ve had to say goodbye to a beloved critter a time or two in your lifetime. 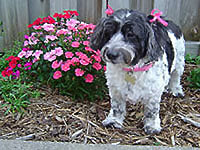 I’ve lost many dogs over the years, and unexpectedly lost two very dear cats, Dickens and Pippen, last year. 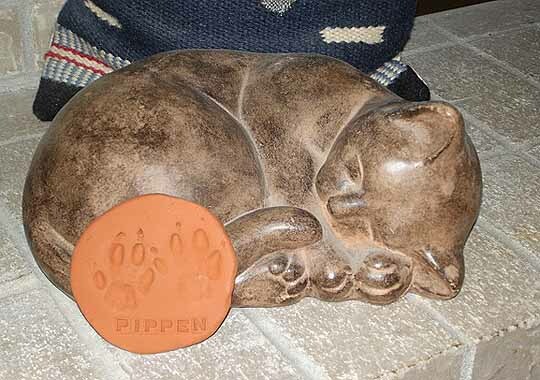 When I took Pippen in to be cremated I decided to have a clay impression made of her paw print that I could keep forever. Oh, how I love that paw print! I keep it on a favorite little table in my living room. 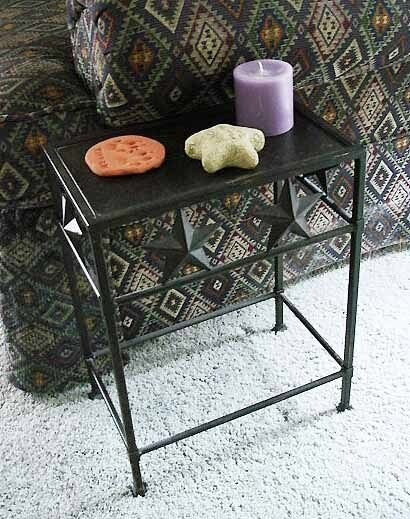 In addition to the metal stars on the side of the table, there is a beautiful star-shaped stone that says Love Faith Hope sitting next to the paw print. The stone was a Christmas present from a good friend, and was the perfect addition to the tabletop. The crystal clear impression of Pippen’s nails is particularly special to me, for I was on the receiving end of those nails many a time in our 12 years together. One incident gave me blood poisoning, but hey – I was probably due for a tetanus shot anyway! I’ve received so much comfort from this clay paw print. My only regret is that I didn’t have them made for all the other critters I’ve said goodbye to. To learn more about making a paw print impression here is one website you may want to visit http://www.veterinarywisdomforpetparents.com/. You’ll find answers to many questions, and can purchase kits at the site. You can also check with your veterinarian or local pet crematory– they may have kits for sale directly to the public. 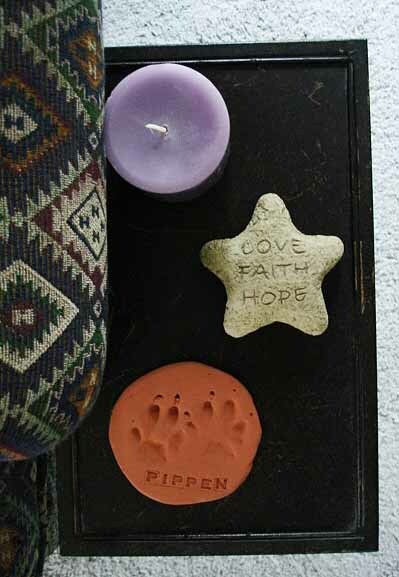 I will always treasure this beautiful keepsake, for the clay paw print matches those that Pippen left in my heart. When Cory passed away the vet sent us an impression of his paw print in clay, which we were not expecting. It meant so much to us that we had an artist make an exact replica so that a rubber stamp could be made. That way I have stamped Cory’s paw print in many of the books I wrote about his life. I know exactly what you mean about receiving tremendous comfort from the last place my baby touched that I can connect with. Chris, this is so sweet. We need something physical to focus on when we remember. Sandra, now I know how special that paw print is in your book, Cory’s Story! I agree, Bernadette. I have a fur clipping from most of my critters, but this paw print is so meaningful to me. Tammy, I’ll be sure to let others know about these special clay paw print kits!